We had a great time and a great show this past weekend over at Leu Botanical Garden in Orlando. The show was blessed with a record turnout and we were blessed with very appreciative and supportive customers ! 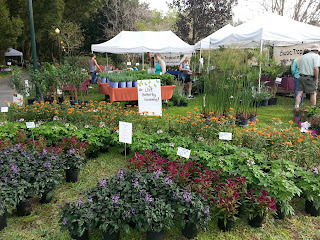 For the next 2 weekends, we are back at our home base of Saturday Morning Market, downtown St. Pete, then come the first of April, more great Botanical shows happening. Here's the scoop on our schedule. This is Tropiflora's annual Spring show. They will have their own stock on sale, plus they invite 20 vendor friends (like us) to set up on the nursery property too, each of us with our own specialties. Free admittance and parking, and carts available. Live music and food available. Note the show hours: Friday 8am-5pm; Sat 8am-5pm; Sunday 10am - 3pm. Sat/Sunday, April 2 & 3rd, Greenfest Plant Show, downtown Tampa, on the historic University of Tampa property. Over 100 vendors from around the state. Show hours both days 9am-4pm. Over 100 vendors up and down the historic main street. Show hours Sat 9am-5pm, Sunday 11am - 4pm. (Please make note, the dates for this show were wrong on recent literature we handed out, so please make note of these correct dates for Winter Garden show).